I was shopping at the mall the other day when I looked over and saw two toddlers at the check out right in front of me. One of them was sitting in his stroller, the other was out and about, hanging on the stroller handles and trying to stand on it’s wheels. Both of them were munching-away on pretzels filled in the stroller’s dashboard. Pretty standard. Then the toddler that was out of the stroller busted out the entire bag of pretzels and decided to eat from his own stash. And that’s when I saw it: GLUTEN-FREE PRETZELS in large print on the pretzel bag. Now, if kids are eating it, it must be good. Young kids don’t have “emotional attachments” to food like we adult foodies do, so if the food doesn’t taste good, they’re not gonna eat it. It’s as simple as that. 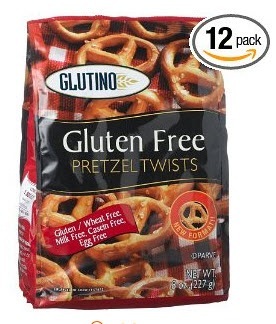 So, the next time I went to the grocery store, I was excited when I saw the same brand of gluten-free pretzels on the shelf: Glutino Gluten-Free Pretzels. I bought a pack and decided to give it a try- and they’re great! Honestly, they taste JUST like regular, gluten-FILLED pretzels… which is rare! Any time that you can’t tell if a food product is GF, that’s pretty much always a good thing. If you want some yummy pretzels to snack on in between meals or along with lunch, try Glutino’s brand! They would also make a great snack-choice to bring along to BBQ’s or neighborhood get-together’s… that way you have something GF (that tastes good) to munch on while you socialize! I like the 8 oz. pretzel sticks and pretzel twists. They cost about $5.00 and if you can’t find them at your local grocery store, you can buy them directly from Glutenfree.com or Amazon.com (which you can buy 12 packs at a time from Amazon! Obviously more expensive than buying just one bag, but if you like them as much as I do, and have kids/husbands/friends that will want to share- then you may want to get some spare bags). I haven’t tried any other products from Glutino (though I probably will try some more of their stuff since their pretzels are so good! ), so I’m not sure if any of their other snacks/baking products/etc are quite as yummy, but just know that you’ll definitely be happy with their pretzels!